We had a wonderful experience purchasing our pug thru Tracie Steele of Des Moines. Tracie has an open door policy always. 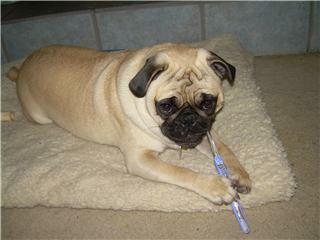 You can come visit the pugs with out an appointment and she is so knowledgeable about the breed. We were able to visit our new pug pup when she was two days old. Tracie told us to come as often as we liked until the pup was ready to come home. For two months we packed up the family and headed over to Tracie’s to visit our baby and watch her grow. When time came for us to take her home, Tracie gave us great care tips and excellent advice on pug potty training. She educated us on dog food, vets, flea meds etc. She really knows what she is doing, and she is extremely resourceful! Something else you may not know about Tracie is that she will board any pug you have purchased from her when you go on vacation. 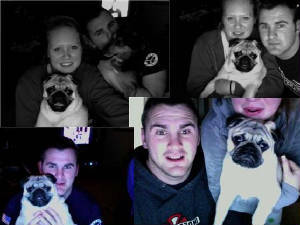 We love our pug so much. She is my third child. She sleeps with the kids and rides in the car. She walks to the bus stop everyday. The whole neighborhood knows her, and spoils her with attention. She is a great playmate for our kids. She likes the same toys as our kids! I would never by a pug from anyone else but Tracie. Once you get to know her and her pugs she sort of becomes part of your family too. We love to come and visit her; it’s a special treat for Roslyn (our pug). She gets to come see Tracie and play with the other pugs. Besides, is there anything cuter than a bunch of pugs running around and snorting? I have been meaning to send you some photos of Holly with all of us during Christmas so here they are! She is doing absolutely great and my mom and sister are completely in love with her. She has just had her second round of shots and is growing like a weed. She's learning to sit and is very smart. My mom has a cat who loves to play with her and they even sleep together. Anyway, the first photo is Holly crashed out on the sofa, the second is Holly with a family friend, the third with my sister Tammy, the fourth with my partner Rebecca and the last one with my mother & I taking a winter walk down by the river in Leavenworth. We're very happy with Einstein the brindle pug. We did give him the middle name of "Trouble" because especially as a puppy he would pick up everything on the floor and either chew it or take it and run if he knew he was not supposed to take it. Especially now that he's one year old, he has gotten progressively easier to live with. He tells us when he needs out, and can go on long or short walks. We got a kennel with the intension of kenneling him at night the first night we took him home as puppy, but his incredibly cute whine got to me enough that I slept on the floor next to him with my hand in the cage to sleep on. From there, he quickly got accustomed to the bed, and he loves to take up so much room that Courtney and I regularly wake up on the edge with a very comfortable pug sprawled out between us. He's now alright with whatever is going on, if you're active, he's active, if you want to take a nap, he'll rest on your neck and snore in your ear. It was somewhat annoying at first, but now we miss sleep if we don't have his soothing sound. We've taken him to doggie day care, but now he stays at home. I think it helped him in his interactions with other dogs, because he always good and never snaps at other dogs. He does think he's about 100 pounds larger than he is, and he has no problem running and playing with much larger dogs. He also ignores a family cat. One very cute thing he does is when a siren from an ambulance or a police car rings by, he howls. He first did it at about 3 months old, and it almost drove Courtney off the road since she was laughing so hard. He has had good health and we've only had incidents from getting things from doggie day care and what Einstein decides to eat off the floor. He is brindle, and we absolutely love the way he looks. He is also a very special dog when brought to pug meetups as there are only a few in the area. At Pugapalooza we also heard that his "double curl" (tail wraps) is nice. Again, at about a year he seems like the easiest dog to own. Courtney was set on getting a French bulldog for our next dog, but since Einstein has been so great and he love playing with other pugs, now she wants another pug! We look forward to the meetup. Hello! 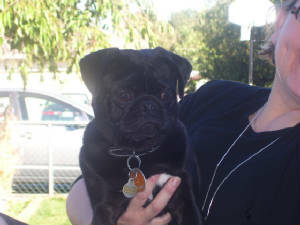 I would like to tell you about the precious pug my husband and I got from Tracie in 2005. Our little fawn pug was only 2 weeks old when we first met her at Tracie's house. We were pretty inpressed with Tracie rooming with the baby pugs and family. We also liked the other animals - dogs and cats, that lived there as well. We came to visit our baby pug a few times until she was old enough to go home with us. Poogus was great being housetrained and slept in the people bed from day one. The only problem we have had with Poogus the pug is getting her spayed. We wanted her to have puppies but decided against that since we just had a baby girl. Poogus has been great with her from the beginning as well. And when the time comes when we can have another dog we feel confident knowing that Tracie enjoys breeding pugs. We'd let Poogus go pick out her new friend. Our neighbors are impressed with how fit Poogus looks too - no fat pug yet. She also enjoys sitting in my lap checking everything out as I type. Pretty smart comfortable dog. comment: Hi Tracie, Great new website, so much great information! I'm so excited to know you are having more pug puppies! Your pugs are the very best! Tater Tot is thriving (7 months), he's Chop Chop and Pricilla's son. Oliver (1 1/2) is as awesome as ever, he's Chop Chop and Mavis's son. He actually will swim out into the lake and fetch a stick, no kidding, he goes out swimming 20 feet or so to bring back his prize! Putzie (7 months, and tater's half sister) is Chop Chop and Porky's daughter and she is the busiest and most fun pug of all, she is just like her mama, super active and sweet with never ending energy and joy! All of our pugs are well and extremely healthy! Cookie is doing well too! I get to pug nanny her from time to time and love her like crazy!!!!! I'll send you pictures as soon as I can. Best wishes with the new puppies, I'll let everyone I care about know about your babies to place them because you are the best breeder with the healthiest and most even ! Half of Rena with her pug "OLIVER"
Hello Tracie! My family and I bought Lucy from you. She's been such an amazing dog! I love her to death, no health issues, she’s healthy as ever, but my her braveness got her a scratch on her eye. She thinks she’s invincible when she’s around my cat. But she’s doing better now. Here is a picture of her these days. The picture is her when she got a hold of my tooth brush! HAHAHA! OWNER IS SAMATHA KEITH THIS IS LUCY! I have no complaints. 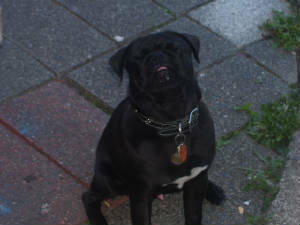 We have a very smart Pug which my daughter has tought to do sit,row,play dead,lay down, and is in great health. Tracie was very nice with us at purchace and keeps in touch with us about Pug get togthers.